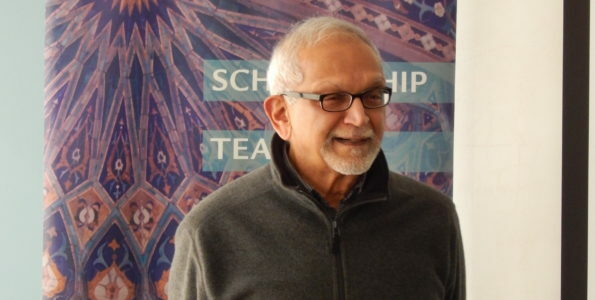 Shreya Parikh is a doctoral student in sociology at the University of North Carolina at Chapel Hill. Her research focuses on the question of religion, immigration, and politics in France and the Middle East. Before moving to the United States, she did her undergraduate and masters-level studies at Sciences Po Paris in France. She tweets @shreya_parikh. A scene from the film La Haine (The Hate – 1995). This is seconds before the policeman (center) shoots Vinz (left) in the head. In the end, Hubert (right) and the policeman get into a fatal duel. La Haine was produced by Mathieu Kassovitz taking inspiration from the murder of Makomé M’Bowolé, a 17-year-old Black man, at the hands of a policeman in 1993 in Paris. The state violence as well as the general helplessness in the face of poverty are not new in the banlieues – the suburbs of cities like Paris, Lyon, and Marseille. These spaces were designed to house those who were already marginalized, and to keep them marginalized. They housed the migrants coming from the countries colonized by France – Algeria, Tunisia, Senegal, Mali among others. Today, this mixture of social, political, and economic helplessness has become more widespread, no longer locked away in the peripheries, but emerging right at the heart of the cities. 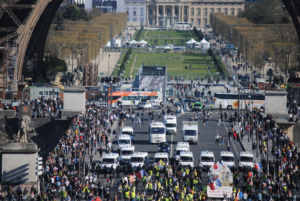 With the parallels in public anger and police violence, it is not surprising that many are making the links between the events that have been termed as “les émeutes” (the riots) in the French suburbs, especially in 2005, and the Gilets Jaunes protests. 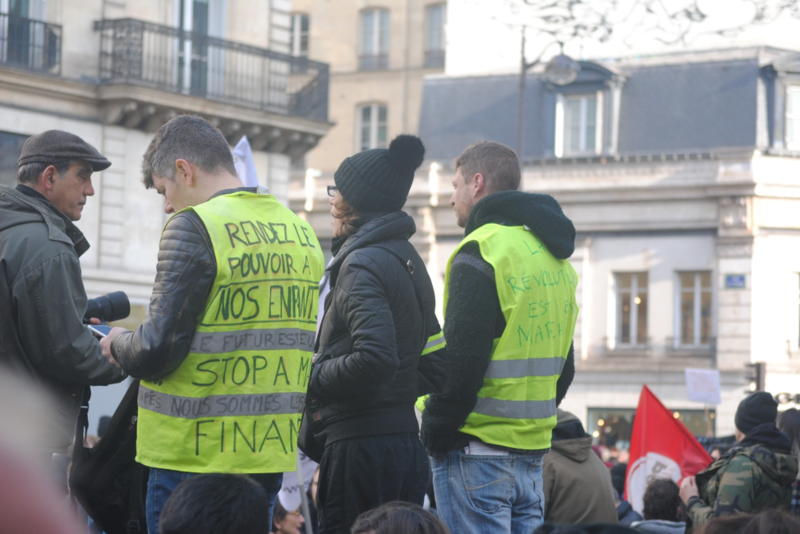 As the Gilets Jaunes (Yellow Vests) protests in France enter their twenty-third week, much has been debated about the French government’s tax policies, increasing cost of living, falling wages, and employment uncertainty. 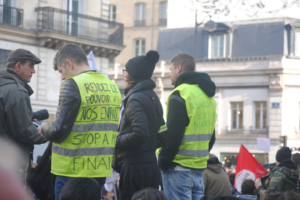 There is unanimity within the Gilets Jaunes movement around the existence of these economic issues. But the question of immigration, a popular topic of discussion entangled with discourse on identity, seems to remain absent. 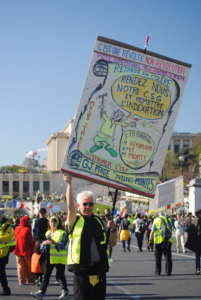 The Gilets Jaunes movement started in October 2018 in the form of blockages of roads and roundabouts to protest against the rise in gas prices. Starting 17 November 2018, Saturday protests have been organized by Gilets Jaunes all over the country, in both urban and rural areas of France. As this nascent movement seeks to unify everyone who feels marginalized under the current system, it remains silent on the issue of immigration that could easily lead to internal fracturing. 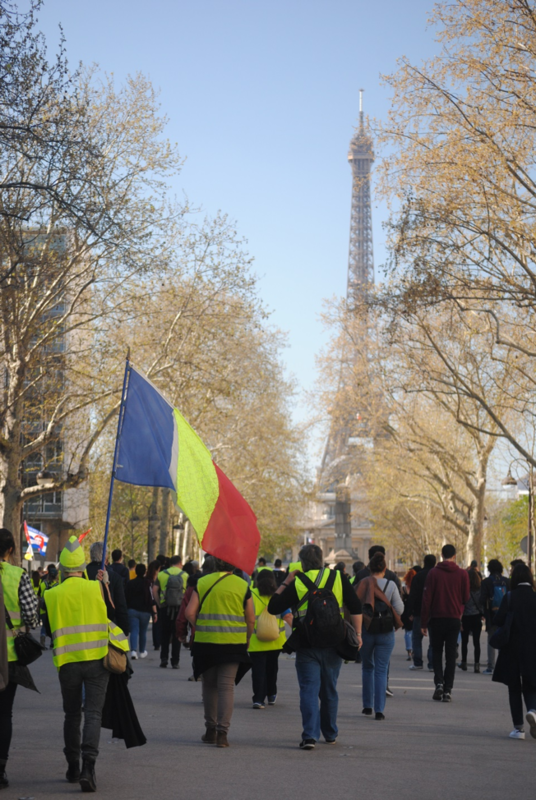 Protestor holding a French flag with the neon green (instead of the white) representing Gilets Jaunes during the 20th Gilets Jaunes march on 30 March 2019. (Photo by Shreya Parikh). Le Monde, one of the major French daily newspapers, analyzed opinion survey responses from 166 protestors between 24 November and 1 December 2018; 55 percent of those analyzed were men and 44 percent were women. The average age of a protestor was 45 years, slightly higher than the average age of the French population (around 41 years). 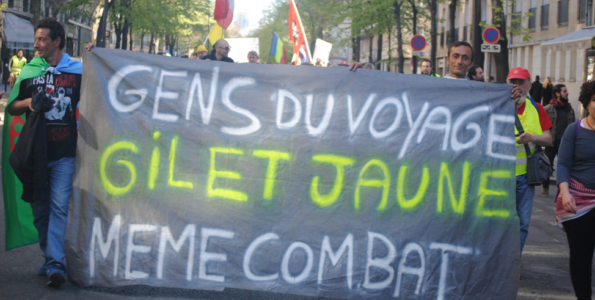 These protestors have modest revenues but are not the poorest of the poor; the median revenue per household of a protestor was around 1700 Euros per month (around 23 000 USD per year), which is 30 percent less than the median household income in France in 2015. The Gilets Jaunes marches include individuals with a variety of political positions. They do not identify themselves clearly, as a group, on the right-left political divide. 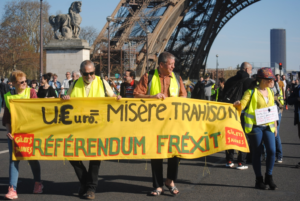 The Gilets Jaunes marches are filled with pro-Frexit (i.e. removing France from the European Union) groups, pro-Roma rights groups, priests and pastors, women’s rights groups, anarchists, groups against the raising of tuition for non-European Union students, communists, as well as people who say that they are angry and want nothing to do with politics. What they all share is a distrust in the “établissement” or the current political system in power. The popular distrust in the current establishment has been growing for some time. According to an opinion poll conducted by IFOP, a French pollster, for a major weekly, positive opinion regarding Emmanuel Macron’s presidency continues to fall since he came to power in May 2017. While 62 percent of those polled had a positive opinion of President Macron’s governance in May 2017, this figure has fallen to around 30 percent since September 2018. Certainly, among the Gilets Jaunes, we could expect that figure to be much lower, given that the only unifying factor in all those protests are a rejection of Macron and what he is understood to represent. At the same time, there has been a fall of support for Gilets Jaunes (from 40 percent of the French who didn’t support the movement in end-January 2019 to around 50 percent over the last month according to OpinionWay, a French pollster group). One of the reasons for this fall is what is described in the popular political discourse as the “violence” of those protesting, be it throwing stones, looting stores, or setting cars on fire. Yet as sociologist Laurent Mucchielli argues, this “violence” that the media focuses on is a “moral category” (or a “value-judgement” as Max Weber would call it), which should be avoided while undertaking a scientific study of an object. 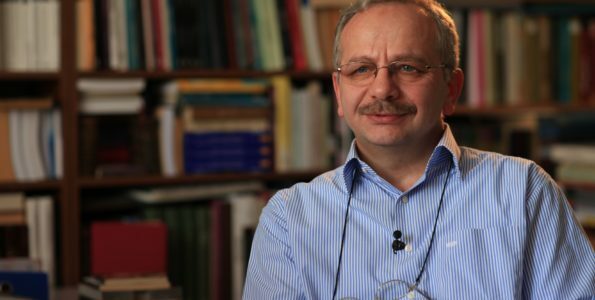 According to Mucchielli, the focus of analysis should be the circumstances that lead the acts of violence to be committed and not the violence itself. With this background in mind, how can one contextualize the Gilets Jaunes protests? Is the political and social context leading to Gilets Jaunes linked to the coming to power of Macron? According to French novelist Édouard Louis, the popular anger towards the Establishment is not new. In the 1980s and 1990s, he argues, a “conservative revolution took place in Europe, and the institutional left stopped talking about poverty, they stopped talking about work, they stopped talking about pain.” Upon finding this new set of potential voters, it was the far-right in France that took up the task of representing the poor. Pro-Frexit members marching at the Gilets Jaunes protests close to the Eiffel Tower on 30 March 2019. (Photo by Shreya Parikh). Accordingly, the context in France bears striking parallels with the political situation on the other side of the Atlantic. The “politics of resentment” described by sociologist Katherine Cramer in the context of rural America paved the way for the election of President Donald Trump and points to similar concerns as those highlighted by Louis. The transatlantic parallels in the rise of the right-wing groups does not mean that the Gilets Jaunes protests can be described as a form of white working-class consciousness. My observation at protest sites and conversation with participants over the last two months indicates that the population protesting on the streets or participating in strikes is ethno-racially mixed. 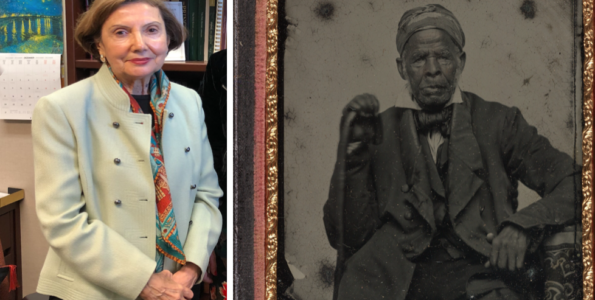 It includes people of color, many of whom are first-generation (im)migrants to France or trace their ancestry to migration. In addition, there are many who are unable to participate in Saturday protests because of their precarious positions. As one of the participants in a march said “I have many friends who are Black, who are male, who are Arab, who are without papers. They all wish to join the [Gilets Jaunes] march. But they are afraid. 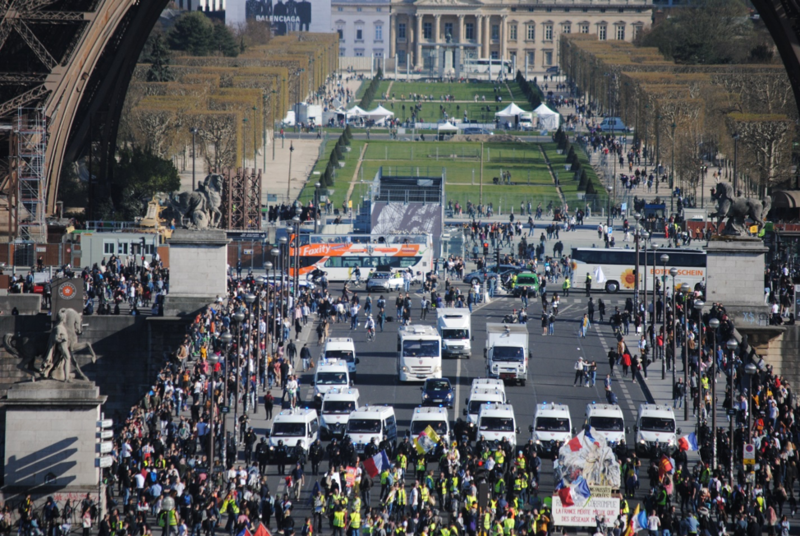 They are afraid of being surveyed, they are afraid that they will be targeted and picked up by the police.” Another factor to take into consideration regarding who participates in protests that take place on Saturdays is that many in the French labor-force work over the weekends. According to INSEE, 35 percent of salaried (contractual) workers worked at least one Saturday out of four during the course of 2017. This number was higher (around 70 percent) for those in non-contractual positions, many of which are taken up by those without papers or legal status. Many speculations have been made, by both left- and right-wing groups, about the stance that Gilets Jaunes should take on immigration. Many left-wing groups, especially those with members who are immigrants or descendants of immigrants, have drawn links between the Gilets Jaunes protests and the protests in the French banlieues or suburbs that started in 1970s. The state violence as well as the general helplessness in the face of poverty and falling opportunities of social mobility are not new in the banlieues populated by the underprivileged, formed largely of immigrants and their descendants. According to these left-wing groups, police violence no longer remains exclusive to the urban peripheries. Protestor representing Yvelines-Mantes region in Ile de France, in the suburbs of Paris, on 30 March 2019. 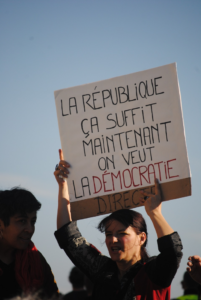 The banner asks people to vote against Le REM, short for “La République En Marche!”, in the upcoming European elections. Le REM is a political party created by President Macron in 2016. (Photo by Shreya Parikh). On the other hand, right-wing groups have used the political demands of Gilets Jaunes to infer that an anti-immigration stand is most compatible with the politics of the movement. These groups view the movement as specifically rural and representing white working-class members whose jobs are being “taken away” by the immigrants. At the same time, these groups are dissatisfied because of the absence of any strong stance on immigration taken by the Gilets Jaunes. For example, Pierre Cassen, the founder of an extreme-right website Riposte laïque, claimed that the reason the French do not benefit from their tax payments is because the immigrants benefit for “free” from the social welfare that these taxes fund. He is surprised that the “exorbitant price of immigration” does not show up in Gilets Jaunes’ list of issues to be addressed by the state. That the causes of forced migration be addressed. That asylum seekers be treated well. We owe them housing, security, food, and education for minors. Work with the UN to have host camps open in many countries around the world, pending the outcome of the asylum application. That rejected asylum seekers be returned to their country of origin. That a real integration policy be implemented. Living in France means becoming French (courses on French language, history of France, and civic education with certification at the end of the course). There is a sense of ambiguity in these demands. The first two leave unanswered the role of France in addressing the issue of migration – should France have host camps? Do the causes of forced migration lie partly within France, or are they strictly elsewhere? The fourth, calling for integration of those already present in France, has been agreed upon unanimously by both left- and right-wing groups. At the heart of immigration debate is the content of the integration policy, not the need for having a policy. Only the third demand presents a clear stance on migrants, calling for expulsion of asylum seekers whose files have already been rejected. Taken together, the four demands offer no clear stance on the question of immigration. This is not surprising, given the peculiarities of the political environment in France. According to an opinion poll conducted by IFOP in November 2018, 84 percent of those interviewed agreed that “immigration is a topic about which one cannot talk about serenely in France.” Hidden behind this tension related to expression of opinion is a popular negative perception of immigration, with 58 percent of the population agreeing that immigration in France plays a negative role overall (compared to 17 percent who say that it plays a positive role overall). Security forces encircling the protest site towards the end of the march on 30 March 2019. Clashes between security forces and protestors have taken place during multiple instances all over the country. (Photo by Shreya Parikh). In France, the terms ‘immigration’ and ‘Islam’ are used synonymously in much of the political debate. As Thomas Deltombe argues, the waves of migration from the ex-colonies of France in 1970s and 1980s were politicized in a context of the Iranian revolution as well as weight of the Algerian war of independence. This process of politicization continued into the 1990s with the “headscarf affair” and in 2000s with the September 11 attacks. Over the years, both ‘immigration’ and ‘Islam’ have been constructed as a single “problem” that needs to be addressed through a centralized policy of integration. Initiating a conversation on immigration risks this conversation being taken over by the over-politicized “problem of Islam,” most recently seen in the form of the polemic on a sports store proposing to sell sports-hijab for Muslim women. Given these risks, one would expect the Gilets Jaunes to avoid raising the question at all. Only 2 of the 166 protestors interviewed by Le Monde mentioned the “management of immigration” as being either the reason of their protest or an action that the government should take. As the movement matures, it will be faced with increasing pressure, both external and internal, to navigate the political tensions that come with the amalgamation of Islam and immigration in the French political sphere. What remains to be seen is if the movement can become a ground to discuss topics related to (im)migration law and address discrimination facing those perceived to be an immigrant without falling into the traps of various amalgamations that complicate an informed debate on these issues.